Labour will stamp on the green shoots of recovery if they remain in power, the Conservatives have claimed, while Gordon Brown argues Tory tax plans will plunge the economy back into recession. The main political parties clashed over tax and spending plans ahead of tomorrow's expected launch of the general election campaign. Four weeks of political campaigning will begin when Gordon Brown travels to Buckingham Palace to seek the dissolution of parliament - setting the stage for the election on 6 May. The Conservatives launched its poster campaign for the forthcoming election, which focussed on Labour's plans to cut Britain's record deficit. The Conservative campaign poster depicted a bleak landscape with just one green shoot emerging from the barren ground. 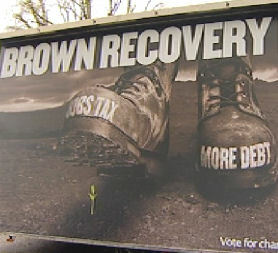 Two boots bearing the words "Jobs Tax" and "More Debt" loom over the plant, as if just about to crush it. The shadow chancellor George Osborne said Labour's plans to increase National Insurance (NI) contributions by one per cent from April 2011 would kill the economic recovery. "The choice in this election is very, very clear. You have either got Labour stamping out the recovery, stamping on the green shoots, or the Conservatives avoiding the jobs tax," Mr Osborne said. He estimated that Labour's planned increase in NI contributions would cost the NHS, the country's largest employer, £200m. "I think it comes down to priorities. Do we want the money going on additional National Insurance in the NHS or on new cancer drugs?" he said. Mr Osborne said the Conservatives could avoid the NI rise by cutting "wasteful government spending". But Chancellor Alistair Darling dismissed criticism that the NI rise was a "tax on jobs" and said that the plans were vital to the economy. The NI rise was an essential part of his wider package for consolidating and building on the economic recovery, he said. In his weekly podcast Gordon Brown drew parallels between the economy and the recovery of footballer Wayne Rooney's ankle. "After an injury you need support to recover…So with the economy, we are not back to full fitness," the prime minister said, likening the England footballer's attempts to recover in time for the World Cup to the health of the economy. "If we try and jump off the treatment table as if nothing had happened, we'll do more damage to the economy - and frankly that means we risk a double-dip recession. I think that's a risk we can't afford to take," he said. Labour claims the Tories will take £6bn out of the economy without knowing how to pay for it is their NI plans go ahead. The Conservatives said its calculations showed the revenue the Treasury received from NI had risen by 22 per cent in real terms since 2001-02, five times the four per cent growth in income tax receipts over the same period. It said that while the amount the average family paid in income tax had risen by £47, their NI contributions had gone up from £2,725 to £3,239 - an increase of £514. The Liberal Democrat leader Nick Clegg accused the Conservatives of "treating people like fools" over their planned NI cut. Launching one of his party's election battle buses in north London, Mr Clegg said: "Any increase in taxation is unwelcome, but that is not the issue." "The issue is what can you do to change it, and what I think that people now know is that you can't have something for nothing and David Cameron is treating people like fools," he said. "He thinks he can promise the earth and not spell out how they would pay for it. I think those days are over."